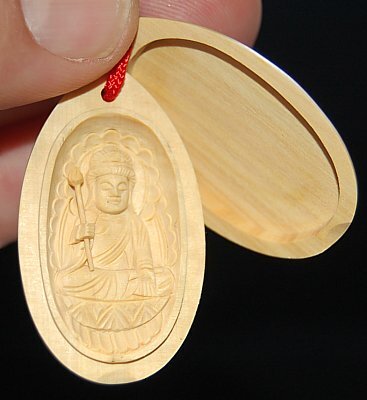 Two pieces: (1) protective cover and (2) main piece with the deity's effigy; both pieces snap together snugly for compact-safe storage; red string attached. 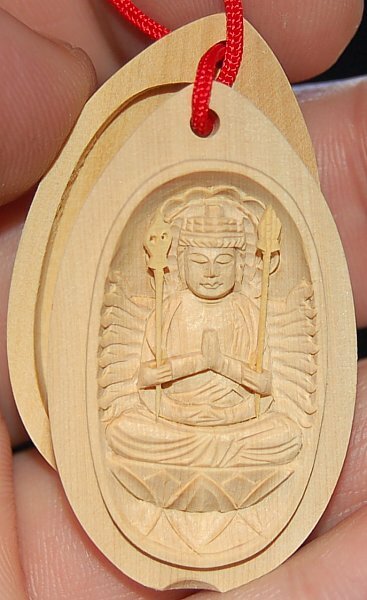 Kannon (1000-armed version, called Senju Kannon) sitting atop a lotus petal; central hands in Mudra of Veneration (Prayer, Aspiration); right arm holding pilgrim's staff and left grasping Vajra club; latter represents the indestructibility of Buddhist law and its power to vanquish evil. See Kannon Notes. Kannon also serves as patron of people born in the Zodiac Year of the Rat. 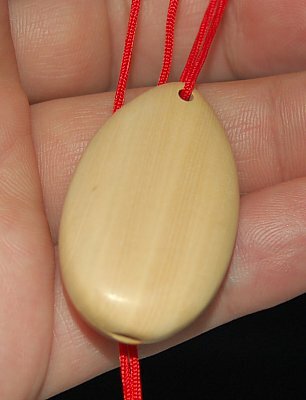 Amulet comes in two pieces, attached by red string. Above is example of amulet size (example deity is Sho-Kannon).